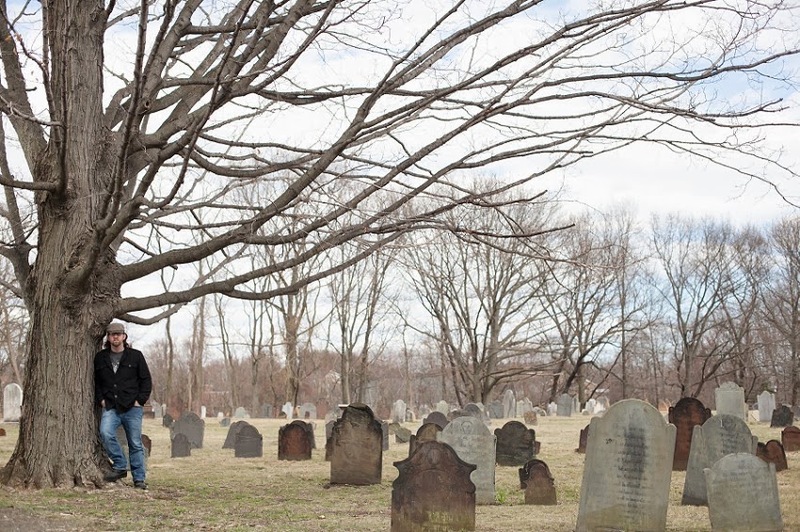 September 21, 2013 — I went to Milford Cemetery in Connecticut, for one reason: The mass grave of 46 smallpox-infected Revolutionary War POWs. 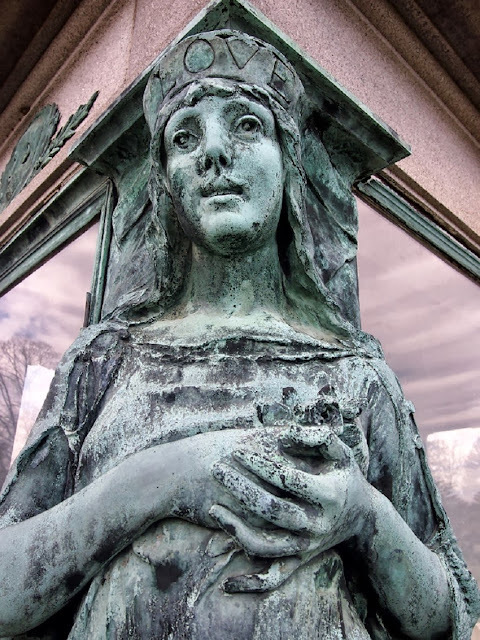 That's enough of a reason, and I wasn’t expecting much else there, but the graveyard surprised me. But let’s talk about that mass grave first. On January 1, 1777, British ships dumped 200 American soldiers onto the shores of Milford Harbor. These men were all suffering from smallpox, and the Redcoats wanted none of that business. Those of the soldiers who could, left for their homes, but many were too sick to travel and were cared for by the people of Milford. However, within a month, 46 soldiers had died of the contagious disease, along with one of their Milford caregivers, a Captain Stephen Stow. The soldiers and Stow were buried in single grave in the local cemetery. 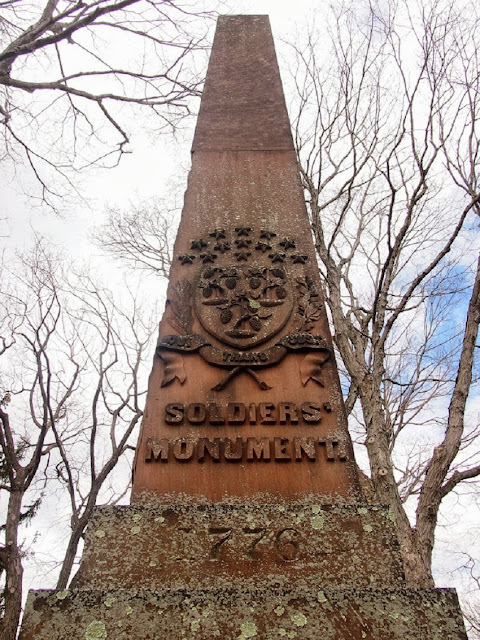 But that chapter in the town’s life stuck with the people of Milford and, in 1852, a large brownstone obelisk called the Soldiers’ Monument was erected on the spot. 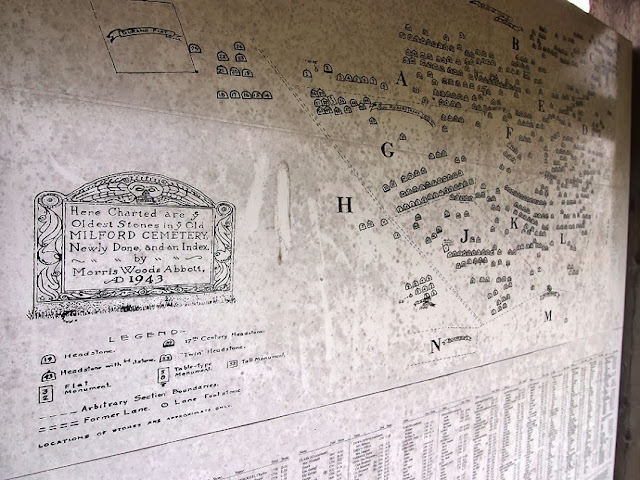 It both tells the story of the soldiers and lists their names and hometowns. Captain Stow gets an entire side of the obelisk. For some reason, this story seems particularly vivid to me, and I pretty much had tunnel vision for the monument when we entered the relatively small cemetery. But after reading every word inscribed on it and taking a pic of it from every angle (only to post one here, apparently), I came up for air and looked around. What I hadn’t noticed at first, and what I should have known outright just from the existence of the Soldier’s Monument, was how ancient this graveyard was. The sections near the Gulf Street entrance contained more modern tombstones, making the graveyard seem deceptively plain from the outside. 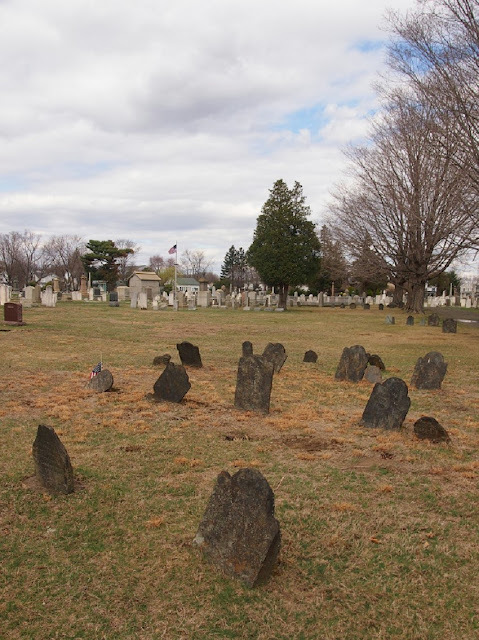 But dotting the southern area near the Soldiers’ Monument was a plethora of aging stones. We took this photo from below ground, somehow. I’d find out later that the cemetery was established in 1642, so more than a hundred years of history is buried there even before the smallpox incident. And the history after it is nothing to overlook, either. 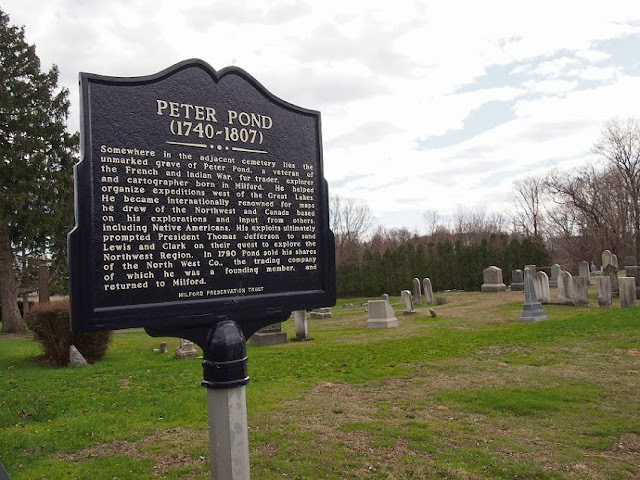 For instance, somewhere beneath that grass is one of the original explorers of the American continent, Peter Pond (1740-1807). 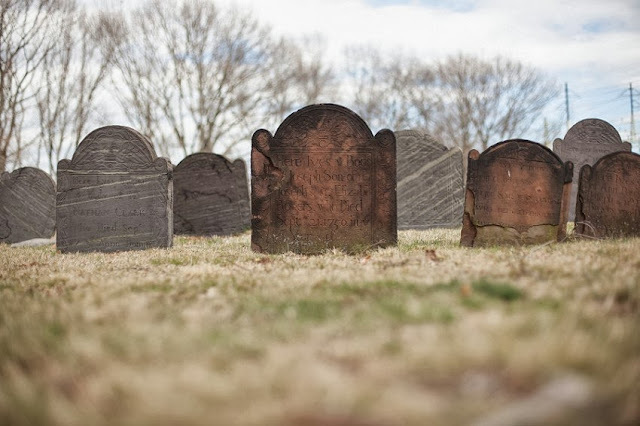 Some of the graves are no more than nubs of stone, sculpted back when there were more important, survival-ish things to do than make grandiose deadboards. 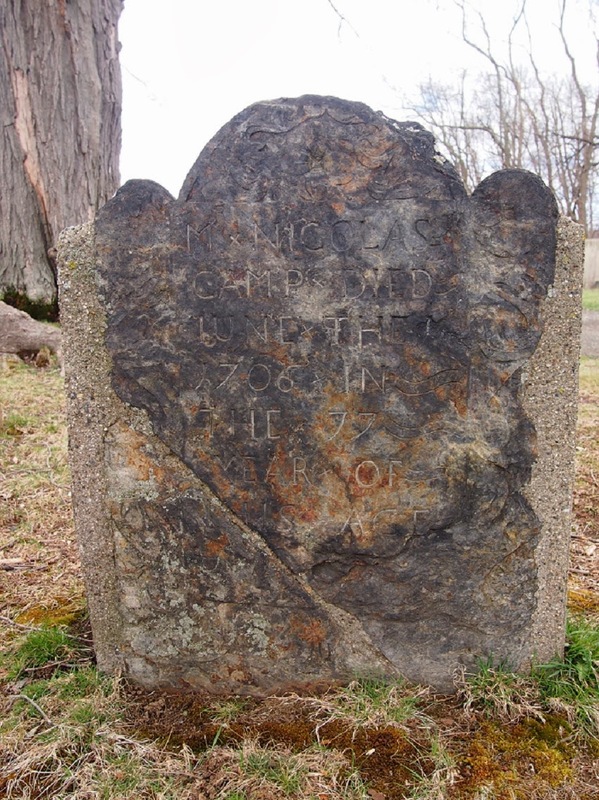 Others are the classic New England stones, thin, poetically epitaph’d, and topped by engravings of skulls. Despite not being a secluded cemetery at all, we found its older bits to be exquisitely atmospheric …until a passenger train roared by. The tracks basically form its southern border. But aside from these many gems of history, is an extremely precious gem of art. The Nathan A. Baldwin memorial. 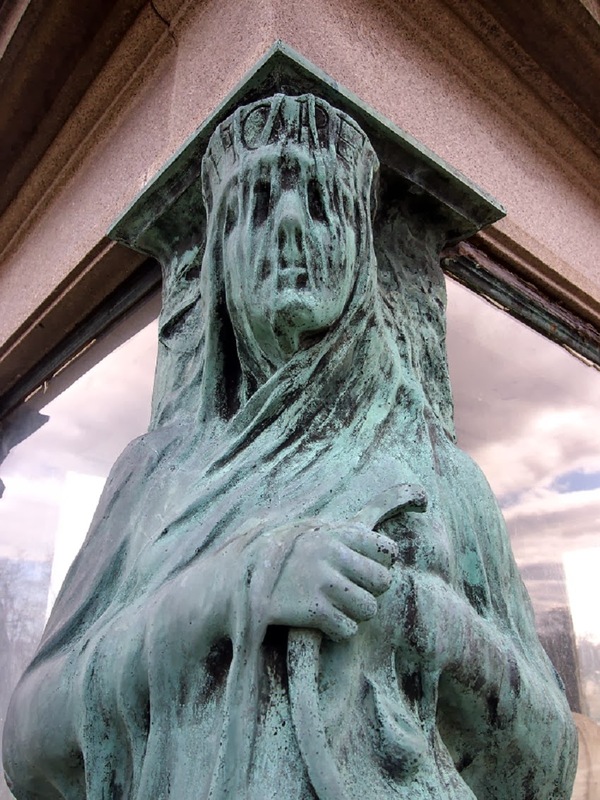 We passed this on the way to the Soldiers’ Monument, and were immediately struck, even through my tunnel vision…but we still saved it for dessert. So to speak. 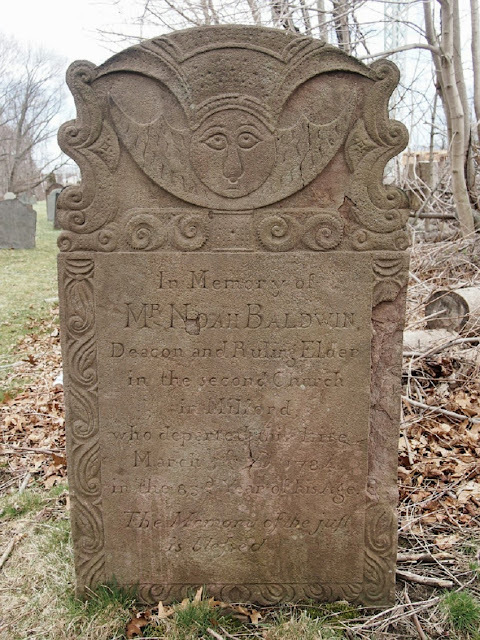 Baldwin lived from 1824 to 1898, but he has no real story that I can find. 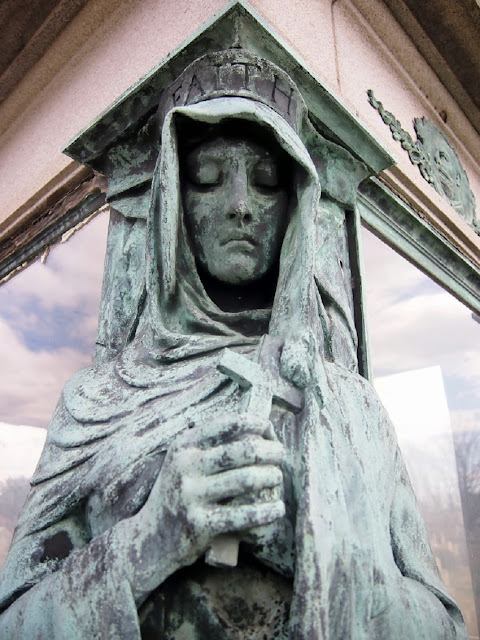 However, having an awesome funeral monument might be story enough for anybody. 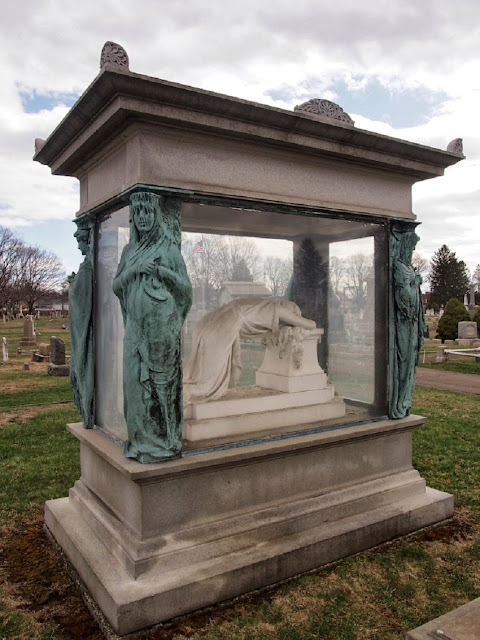 The large glass case holds the life-sized marble sculpture of a grieving woman, but it’s the four women at the corners of it that really make it stand out. Each one is a unique sculpture, and each bears her name on a crown: Grace, Hope, Love, and Charity. Ordinarily, those are all things I want in my life. But, hell no, if they’re really that spooky looking. 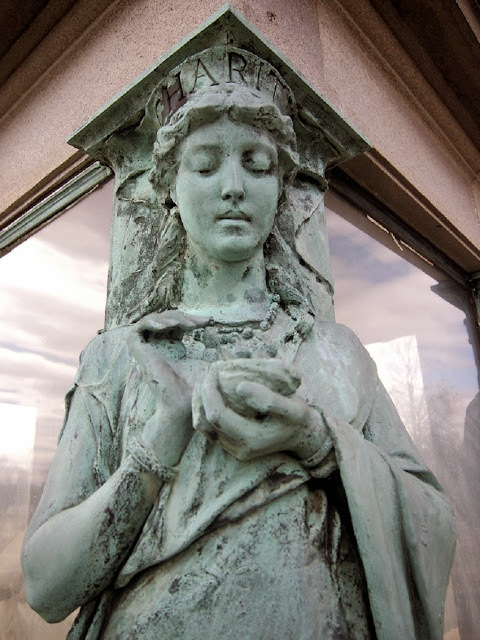 Overall, Milford Cemetery is the kind of place you want to take stone by stone, puzzling out each aged epitaph, hunting for the oldest death years, and just feeling history and mortality brushing at the bottoms of your shoes.